The Druk Path Trek in Bhutan is a 10 day trip in total, but includes 6 walking days. It is a popular excursion through the stunning countryside and a striking natural landscape of forests, hill side ridges and pristine lakes. The trek is also combined with the cultural excursion in the hidden villages of Bhutan and explore the historical Lhakhangs, Dzongs and villages. This trek also offers hikers stunning views of Mt. Gangkar Puensum, the highest unscaled peak in the world. It also separates the Thimpu and Paro valley. The trek lets you experience the unique culture of Bhutan, visit several farmhouses and travel around the isolated villages. Marvelling around the historical towns and exploring the carvings in Dzongs and temples along with painting are wonderful. 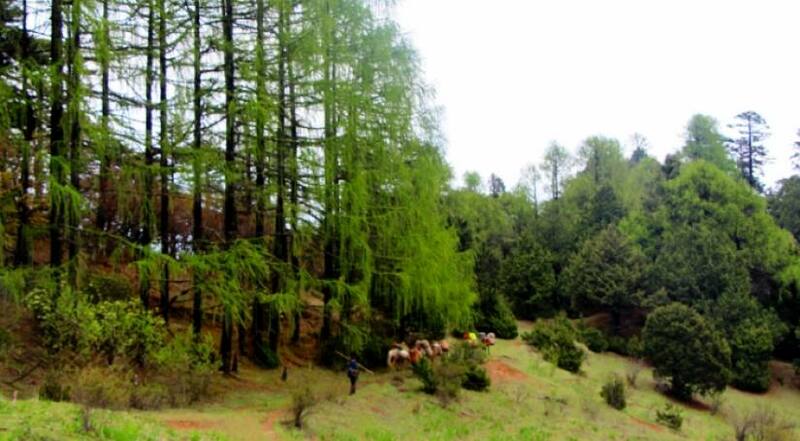 Druk Path trekking is also combined with the Thimpu And Paro sightseeing package. Exploring the ancient temples and Monasteries along with roaming around the local markets and museums is some of the spectacular activities during the trip. March to June and September to November are the best seasons for the Druk Path Trek. Please, feel free to contact Himalayan Joy Adventure to customize the itinerary and get experienced local guides in Bhutan. The flight offers you beautiful view of the Himalayan ranges including Mt. Everest and Kanchenjunga. On arrival and after visa formalities you will be received by Bhutan travel agency. Afternoon / evening time at leisure. Overnight in Hotel. 02 Days PARO TO JELE DZONG 3480M. 03 Days TREK TO JANGCHULAKHA 3780M. At first you will gradually ascent and then descend below the ridge line through the trail of thick alpine forests of rhododendrons. You will see yak herders and fascinating views of Jhomolhari and other snow capped mountains. You can also hear some monal peasants during the day. You will continue ascend up to reach a yak herders’ pasture at Jangchulakha (3,780m) with outstanding views of the Himalayan range. Overnight in Tent. 04 Days TREK TO JIMILANGTSHO LAKE 3880M. the trail follows the ridge and at time through juniper trees and rhododendrons. The views of the mountain valleys of Thimphu and Paro are astounding. You will arrive at Jimilangtsho Lake (3,880m) which very famous. Near the camp, you can have great views of Jichu Drake 6989m which is representing the protective deity of Paro. Overnight in tent. your day will begin with a gradual ascending at 4,150m from where you will have majestic view of Mount Gangkar Puensum and others mountain range then descend to another small lake and you will ascend to the Phume La pass 4210m. The trail slowly descends to a community hall near Phajodhing (3,870m). You will reach the road head of Sangaygang on the outskirts of Thimphu valley. The representative of Bhutan travel will drop you at Paro International Airport for you further journey. Have a save journey! Airport picks up and drops by Private Vehicle. Tips to guides and porters.